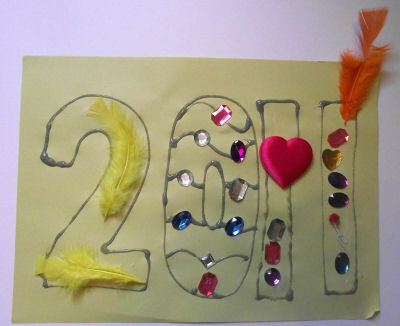 Get the children used to the numbers of the New Year by letting them create their own crafty collage. The more "ingredients" you put, the better. 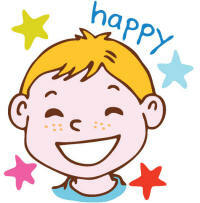 Either draw the numbers for the children or help them draw the outlines themselves. Liberally paint on some white glue (PVA glue) and let them get sticking! 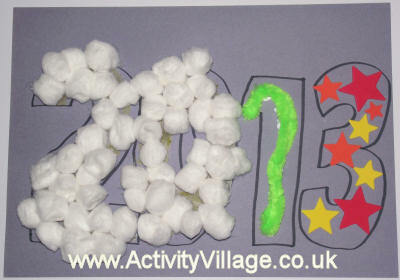 Sam's 2013 collage - he enjoyed sticking the cotton wool balls! 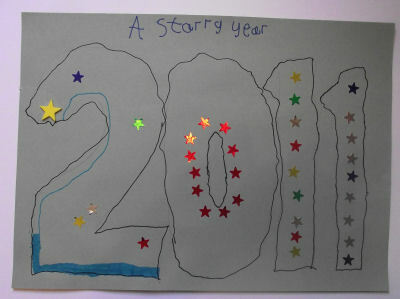 Decorate the house for the New Year - and capture a picture of your child's hands to keep forever, too! It is fun to scrunch up and model with tin foil and this New Year hair band looks spectacular - a shiny way to bring in the New Year! 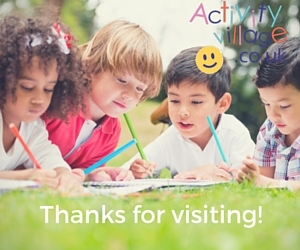 Here's an unusual craft for kids at New Year - perfect if you are having a New Year's Eve party or want the kids to have an exciting "count down" to the New Year!